As of last weekend, I have had a craving for lager. That’s a strange thing for me. I don’t think I’ve wanted to drink lager since I discovered the “craft” (for want of a better word) scene about a year ago. I kinda just lumped all lagers into the same category of mass-produced, bland and fizzy. But last Saturday, after a nice walk in the sunshine with my wife, and then sitting in the garden of the Earl of Essex, I just really fancied a cold, crisp lager. I had a glass of the Konrad 11º pilsner, which really hit the spot. And went nicely with the very tasty burger I’d ordered for lunch. Then, whilst picking up some things in Chinatown the other day, I grabbed a Hite Ice Point and a Hanoi. But these were probably due to the bottle caps I don’t have as much as them being lagers. I had the Ice Point last night, which tastes as you’d expect an Asian light lager. But it was a very refreshing after work drink, and suited the warm weather we had yesterday beautifully. 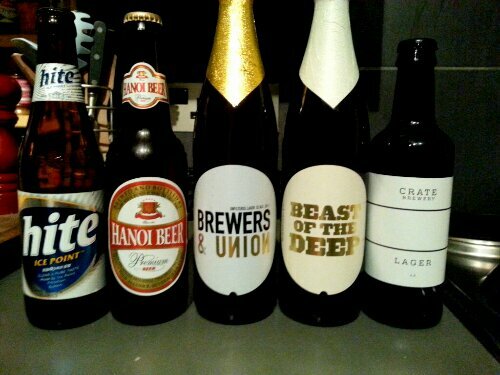 But the strangest thing is that yesterday, on a lunchtime beer excursion from work to Sourced Market in St Pancras station, I came away with 3 lagers – a Crate, and 2 from Brewers & Union. I skipped the Kernels, Beavertowns and London Fields in favour of some lagers. Hopefully flavoursome lagers. I haven’t had anything from Brewers & Union yet, so that’ll be interesting, but I have had the Golden Ale and the IPA from Crate and was disappointed by both. Let’s see what their lager has to say for itself. I got them for a rather ambitious BBQ planned for tonight (since when has a little rain stopped a South African from braaing?). Although, since I woke up to rain this morning, I’m fancying a lager a little less. Could my tastes and palate be so simply tied to the sunshine? The next big surprise is that I’m watching Breaking Bad after all the hype and buzz and recommendations…and not really enjoying it. I find it a bit slow and frustrating and I don’t really like any of the characters. Me and my wife are halfway through season 3 and will finish it, if just to find out what happens. But I’ve come to the realisation that if I don’t like it yet, I doubt it’ll get better. Shame. Oh, and I’m listening to a lot of Björk at the moment. I guess strange things happen when you near 30. ‘Beast of the deep’ was one of the beers i bought for Stu in his ‘beer pack’ last Christmas. Cant remember right now what he thought of it but it was very expensive and maybe not worth the R30 I paid for it. If I am not mistaken it is a german beer ? It is a South African brewery that contract brew in Germany, I believe. And it cost me £3, but that’s the going rate for decent beer here these days. I’ll try it and let you know my thoughts. What do you think about these to keep the beer cold but not dilute it? http://www.thinkgeek.com/product/ba37/ Maybe not for a nice flat and warm British ale.